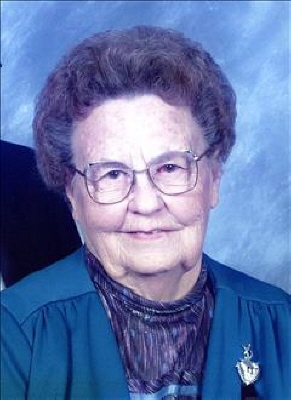 Genevieve Edwards, 101-year-old Woodward resident, peacefully passed from this life in Woodward on Friday, November 9, 2018, in Woodward. Funeral services will be held at 2:00 p.m. Wednesday, November 14, 2018, at the Woodward Church of Christ with Ray Don Jackson and Ron Guthrie officiating. Burial will follow in the Elmwood Cemetery. Velma Genevieve (Barnett) Edwards was born to Delbert Odell and Zella Mae (Covalt) Barnett on May 11, 1917 at her parentsâ€™ farm home north of Woodward, Oklahoma, in the County Line Community. Genevieve attended the Senate rural school north of Woodward, and graduated from Ft. Supply, Oklahoma High School in 1936. She was united in marriage to R.D. Edwards on June 3, 1939, and they made their first home on their farm north of Woodward. They had one son, Marvin Larry, on May 8, 1942. Genevieve and R. D. were faithful members of the Church of Christ, attending the rural County Line congregation. In 1949 R. D. began preaching and teaching the word of God, commencing what became a lifelong commitment for him and a lifetime of service as a ministerâ€™s wife for Genevieve. His local work led to appointment preaching and gospel meetings at Laverne, Waynoka, and South Flat near Beaver. In 1958 he ceased farming and accepted his first full-time position as evangelist and pulpit minister at the 5th Street Church of Christ in Woodward. They later lived and ministered in Anadarko, Oklahoma City, Tipton, and West Plains, Missouri, before moving back to Woodward in 1978, where R. D. served as pulpit minister for the Rolling Hills Church of Christ until retirement from full-time work in 1983. They continued to minister to the Vici congregation until 2007, commuting each Sunday from their Woodward home. Genevieve was a homemaker, a preacherâ€™s wife, and a servant to all. She loved sewing and working in her yard, but her greatest enjoyment was being a wife, mother, and grandmother. Preceding her in death are her parents; her husband R. D.; three brothers: Raymond Barnett and wife Marie, Herman Barnett and wife Geraldine, and J. D. Barnett; three sisters-in-law: Lillian Rosendale and husband Orville, Erma Readnour and husband Maurice, Verle Chabino and husband Clayton; two nieces: Melanie Rankhorn (James), Laveda Browder and husband Ray; five nephews: Ron Barnett, baby Barnett, Junior Barnett, Leslie Barnett, and Delta Chabino. She is survived by one son, Marvin Larry Edwards of Edmond; two grandsons: Rance Boone and Dunn Renato Edwards of Oklahoma City; one sister-in-law, Beverly Barnett of Hiram, Georgia; six nieces: Debra Sexton and husband Rick of Elkins, Arkansas, Deanna Martin and husband David of Cedar Park, Texas, Tammy Driskoll of Austin, Texas, Quayla Hope and husband Jeff of Hiram, Georgia, Verda McCubbin of Woodward, and Darla Wyatt and husband David of Oklahoma City; four nephews: Delbert Ray Barnett and wife Melinda of Beaumont, Texas, Dale Barnett and wife Joanna of Alpine, Texas, Donald Rosendale and wife Mildred of Corn, Oklahoma, Darrell Chabino and wife Marynel of Oklahoma City; and a host of grand-nieces and nephews, other relatives and friends. To send flowers or a remembrance gift to the family of Genevieve Edwards, please visit our Tribute Store. "Email Address" would like to share the life celebration of Genevieve Edwards. Click on the "link" to go to share a favorite memory or leave a condolence message for the family.